What is an anti-idiotypic antibody? Recombinant monoclonal anti-idiotypic antibodies, highly specific for the immune checkpoint inhibitor drug pembrolizumab (Keytruda). These antibodies inhibit the binding of the drug pembrolizumab to its target, programmed cell death 1 (PD-1), and therefore detect free drug. An antibody pair is ideal for the development of a pharmacokinetic (PK) bridging ELISA. 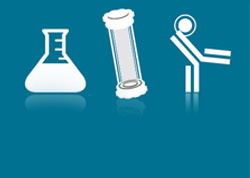 Two antibodies of high and medium affinity are suitable as a reference standard for an anti-drug antibody (ADA) assay. Our recombinant, monoclonal antibodies are generated using the Human Combinatorial Antibody Library (HuCAL®) and CysDisplay®, a proprietary method of phage display, with guided selection methods to obtain highly targeted reagents. The result is highly specific and high affinity antibodies, ideal for development of PK assays. 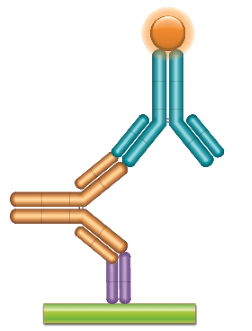 These fully human antibodies are also suitable as controls or calibrators for ADA assays. The in vitro production of recombinant antibodies results in a consistent, secure supply of these critical reagents throughout preclinical development and clinical trials. Table 1. 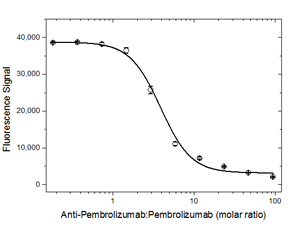 Antibodies Specific to Pembrolizumab. Schematic image of PK Bridging ELISA. Anti-idiotypic capture antibody, Fab format (purple), monoclonal antibody drug (gold), anti-idiotypic detection antibody, Ig format (blue), labeled with HRP. Fig. 1. Pembrolizumab PK ELISA bridging format using antibodies HCA296 and HCA297P. In Figure 1, Human Anti-Pembrolizumab Antibody, clone AbD30689 (HCA296) was coated on a microtiter plate at 1 µg/ml and left overnight. Washing and blocking was performed with PBST + 5% BSA. PBST with 10% human serum, and spiked with increasing concentrations of pembrolizumab was added. Detection was performed using HRP conjugated Human Anti-Pembrolizumab Antibody, clone AbD30685_hIgG1 (HCA297P) diluted to 2 µg/ml in HISPEC Assay Diluent (BUF049A), and QuantaBlu Fluorogenic Peroxidase Substrate. Data are shown as the mean of three measurements. 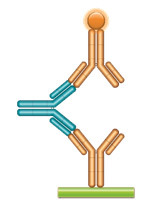 Schematic image of ADA bridging assay.Monoclonal antibody drug as capture antibody and detection antibody labeled with HRP (gold), fully human anti-idiotypic antibody, Ig format (blue). Fig. 2. ADA bridging ELISA using antibody HCA297. 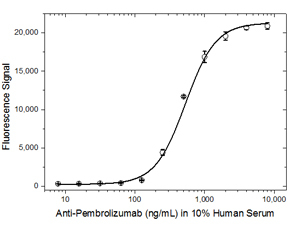 Immunogenicity assay using a human anti-pembrolizumab antibody as calibration standard. In Figure 2, pembrolizumab was coated at 1 µg/ml on a microtiter plate overnight. After washing and blocking with PBST + 5% BSA, PBST with 10% human serum was added, spiked with increasing concentrations of Human Anti-Pembrolizumab Antibody, clone AbD30685_hIgG1 (HCA297). Detection was performed using HRP conjugated pembrolizumab at 2 µg/ml in HISPEC Assay Diluent, and QuantaBlu Fluorogenic Peroxidase Substrate. Data are shown as the mean of three measurements. HRP conjugation of pembrolizumab was performed using a LYNX Rapid HRP Antibody Conjugation Kit®. Fig. 3. Demonstration of the inhibitory property of antibody HCA296. In Figure 3, recombinant human PD-1 was coated on a microtiter plate at 1 µg/ml overnight. 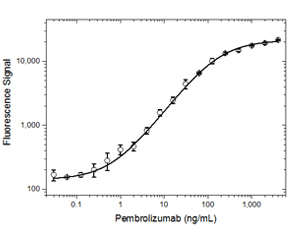 After washing and blocking with PBST + 5% BSA, pembrolizumab was added (0.3 µg/ml), spiked with increasing concentrations of Human Anti-Pembrolizumab Antibody HCA296. Free pembrolizumab, still capable of binding to the PD-1 coated plate, was detected using Mouse Anti-Human IgG (Fc) CH2 Domain:HRP Antibody (MCA647P), followed by QuantaBlu Fluorogenic Peroxidase Substrate. Data are shown as the mean of three measurements. Fig. 4. 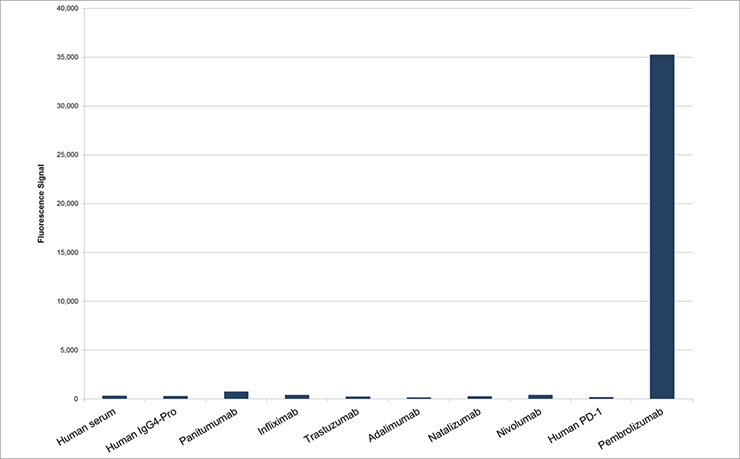 Specificity of Human Anti-Pembrolizumab Antibody HC298. In Figure 4, a microtiter plate was coated overnight with various antigens at a concentration of 5 µg/ml. After washing and blocking with PBST + 5% BSA, detection was performed using HRP conjugated Human Anti-Pembrolizumab Antibody, clone AbD30689_hIgG1 (HCA298) at a concentration of 2 μg/ml in HISPEC Assay Diluent (BUF049A), and QuantaBlu Fluorogenic Peroxidase Substrate. Licensed use: For in vitro research purposes and for commercial applications for the provision of in vitro testing services to support preclinical and clinical drug development. Any re-sale in any form or any other commercial application needs a written agreement with Bio-Rad.